Singapore travel is a unique experience, maybe because Singapore itself is such an anomaly. Southeast Asia's tiny city/country/island is notoriously spotless and somewhat expensive compared to other cities in the region. Singapore ranks first in Asia on the Human Development Index (an indicator that takes into account healthcare, crime, education, quality of life, and other factors), but the country suffers from other challenges. Singapore has a legacy of concrete, heavy taxation of alcohol, and glitzy retail that's just enough to scare budget-conscious backpackers back to Thailand. In reality, the city actually boasts abundant green space and is surprisingly bike friendly. The matrix of trails and skywalks interconnect various parks that help travelers forget that they're in a bustling city of millions! Like Kuala Lumpur, you'll encounter a very diverse population of Chinese, Indian, and Malay people, along with plenty of foreign workers who have made Singapore their new home. 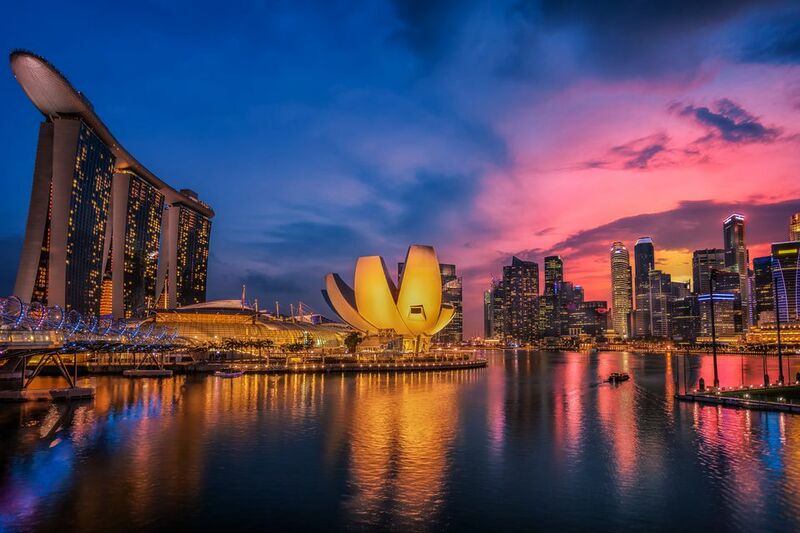 The abundance of cultures blend to make Singapore travel a truly educational experience. Pretty well all Singaporeans are bilingual and speak English, or the local flavor, "Singlish" — although it's officially discouraged by the government. Unlike some of the chaotic capital cities in Asia, order and efficiency are highly valued in Singapore. Cleanliness is prized, and the tap water won't poison you. Getting lost is easy in the sprawling shopping malls that are interconnected both above and below ground. You'll never run out of covered spaces on a rainy day. The pleasant waterfront transforms into an epicenter at night for eating and socializing. At first glance, it may appear that Singaporeans only live to eat and shop! But the city has plenty of cultural and creative highlights found away from the malls. The world-class museums in Singapore could keep you occupied for days. Eating in Singapore is very affordable, however, accommodation is higher than in neighboring countries around Southeast Asia. Entrance fees are comparatively pricey, but you'll often find plenty of free activities to enjoy around town. Locals and experienced travelers know how to save money in Singapore by taking advantage of freebies and discounts. See reviews and prices for hotels in Singapore on TripAdvisor. Residents, particularly expats, sarcastically refer to Singapore as a "fine city" because of the heavy local fines for seemingly small infractions. You can be fined on the spot for chewing gum, riding a bike on the sidewalk, bringing food or drinks onto public transportation, smoking in the wrong places, not flushing a toilet, or jaywalking outside of street crossings. Even getting caught with an illegally downloaded movie or an electronic cigarette could mean getting slapped with a fine at the border. Singapore is often skipped over or only given a few days by budget travelers because of its reputation as an expensive destination — particularly for nightlife and socializing. Although you can easily enjoy incredible cuisine for under US $5 at food courts such as the famous Lau Pa Sat, accommodation, shopping, and nightlife are very expensive compared to other countries in Southeast Asia. Heavy taxation inflates prices on nearly everything. Taxes on alcohol and tobacco are extraordinarily high. Unlike other countries in Asia, Singapore technically has no duty-free allowance for bringing tobacco into the country. Most nationalities do not need to arrange a travel visa before visiting Singapore; travelers from the United States and European Union are permitted a 90-day stay for free. You'll get stamped in for free on arrival. If carrying prescription drugs, bring copies of the prescription and your medical passport if you have one. Singapore has a mandatory death sentence for drug trafficking, so don't even think about bringing drugs from another country! The official Singapore Customs website has specifics about banned items. Singapore ranks third in the world for population density, even outranking Hong Kong for number of residents squeezed into a square kilometer. Although a majority of the population is Chinese, Singapore is a melting pot of people and cultures. An estimated 43 percent of the country's residents were born outside of Singapore. Interestingly, women in Singapore have the lowest fertility rate in the world, however, the high number of immigrants and foreign residents keep the country's population from declining. If you've ever wanted to give couchsurfing a try, Singapore is the place to do so. Plenty of expats offer opportunities to stay with them safely for free. Knowing a local who knows the city is a huge help for saving money and getting beneath the tourist surface. Currency: Singapore dollar (SGD). The typical dollar sign ( $ ) or (S$) are placed before the amount. Division: S$1 is divided into 100 cents. Singapore is home to the highest percentage of millionaires in the world (by disposable wealth). Even billionaire Eduardo Saverin, a co-founder of Facebook, denounced his U.S. citizenship and settled in Singapore in a controversial move that critics say was to avoid taxation. Singapore uses a coin for their $1 unit of currency. Otherwise, you'll encounter colorful banknotes in denominations of $2, $5, $10, $50, and $100. Although $20 and $25 notes are in circulation, you rarely see them. The Singapore dollar is divided into 100 cents. Credit cards, particularly Visa and Mastercard, are widely accepted at Singapore's hotels, restaurants, and shopping malls. Western-connected ATMs are literally everywhere around the city — a good thing, you're going to need them! Tipping is not common practice in Singapore, however, there are some exceptions. You should round up to the nearest dollar when tipping drivers or others who provide a service. Although as a traveler you probably won't be lucky enough to encounter any, Singapore's $10,000 bill is the world's highest valued banknote! The government stopped producing the denomination in 2014 and has been actively removing them from circulation. You'll rarely deal with a language barrier while traveling in Singapore. With so many different ethnic groups needing to conduct business, English is spoken everywhere despite an estimated 20 percent of residents being unable to read or write in English. Even the Singaporean constitution is written in English. Although Bahasa Malaysia (Malay) is an official national language of Singapore, only an estimated 12 percent of residents understand it. Singapore's unofficial, slang-heavy version of English is humorously referred to as "Singlish" and borrows words from Chinese, Tamil, and Malay. Despite Singlish being loosely based on English, tourists can hardly understand the unique dialect punctuated eavily with lots of lah's. Singapore stays warm and receives ample rain throughout the year, however, February is usually the driest month. Haze from uncontrolled fires burning in nearby Sumatra is an annual problem. The fires greatly reduce air quality From May to August. The big mix of ethnic groups that call Singapore home celebrate a number of festivals. A number of Buddhist, Islamic, Hindu, Taoist, and Christian holidays are observed by the different groups. All the big Chinese holidays are celebrated with gusto in Singapore, particularly Chinese New Year, the Chinese Mooncake Festival, and the Hungry Ghosts Festival. Accommodation prices will skyrocket during these public holidays. Ramadan is observed by Singapore's Muslim population, although it rarely affects travel. Singapore National Day is on August 9 and is celebrated annually with a large parade and patriotic festivities. With such a high population density on the island, traffic can be terrible. Private ownership of cars in Singapore is very expensive, but that doesn't stop plenty of residents from driving. Public transportation is by far the way to go in Singapore. The excellent MRT and LRT systems are mostly efficient and clean. The bus system is easy to navigate, and your EZ-Link transportation card (worth getting if you'll be staying for more than just a few days) will save you money and time. Singapore's Changi airport (airport code: SIN) is a work of art. Forget about the traditional, utilitarian airports with drab lights and unhappy passengers; Changi has the ambiance of a large shopping mall. You'll find six open-air gardens, a butterfly garden, children's playgrounds, a gym, showers, a movie theater, and even a swimming pool to kill time during long layovers! Singapore Airlines consistently wins awards for being among the best airlines in the world. If coming overland from Malaysia, try the comfortable bus from Kuala Lumpur to Singapore rather than flying.